When the plates pile up, there’s no greater relief (short of having someone else tackle them for you) than knowing you have an ample reserve of natural, ultra grease-fighting dish soap. And now, with this handy-dandy refill, you’ll have enough to replenish your bottle 2x. So top up that pump, and squirt it directly into the sink or onto the sponge—anywhere you like, really—with no drippy mess. Lemon Mint Fragrance: It’s hard to find two complementary fragrances with so little in common. She’s thick-skinned. He’s what you might describe as delicate. Her vibrant zest stimulates. His strength is in herbal understatement. Yet, together they’re a perfectly refreshing pair. Love is strange. I have been purchasing this refill for Years at well.ca, no complain, works well and cost effective. Works well, nice scent, and like that my hard plastic bottle is refillable. After this purchase though I think I will be switching to a brand that doesn't contain SLS (like Dr. Bronner's) or to a refillable dish soap at my local bulk store. I like the smell, feel safe using it to clean my baby bottles, LOVE THE REFILLABLE format of this product. Well.ca has so many great sales going on I have never had to pay full price! Great smelling! Was a very relaxing and detoxifying bath! I like this product. Nice & refreshing smell. Love the smell so fresh,all natural product that I use it in my vegetable garden to ward off aphids. My favorite dish soap! I use it to wash walls and floors too as the smell is light, fresh and clean and doesn't dry my hands out. I absolutely LOVE this product .... smells great, soft on my hands, and cleans well - I am hocked!!! Nice scent, effective, convenient refill format. Great smell, not too intense. Like the minimal packaging. Works great, and love the eco packaging. My favourite scent of their dish liquid line, like lemon verbena. Cleans great and love the light and refreshing scent. I will buy again for sure! Works great on greasy dishes! I love being able to buy a refill package! Hooray! Works great. Only need one pump. Nice scent, economical, cleans effectively. Method is the bomb. This dish soap is my favourite, I love being able to buy a refill package. It is really effective on greasy dishes. I find the lemon scent very pleasant and helpful for stronger smells. works well as a refill, easy to get all the product out, but I actually found the lemon scent too strong. When I am running low on dish soap I always purchase this refill! Economically friendly, smells so fresh, and packs a powerful cleaning punch! Love this product! Excellent results and love the smell! So fresh! Great dish soap and great fresh lemon scent. I love this brand, it works great, but I like the other scents of this soap better. Love Method dish soap, pleasant sent and works great. Definitely get 2 refills out of this! The scent isn't my favourite but it works well! I am not sure how this soap got such good reviews, I decided to try this after using Attitude and Dapple and was sorely disappointed. If you are using it to clean baby bottles or pet dishes I would definitely say skip it. Great soap-- cuts grease nicely and is an awesome scent combination. I love that the scent not overpowering either like some other soaps are. 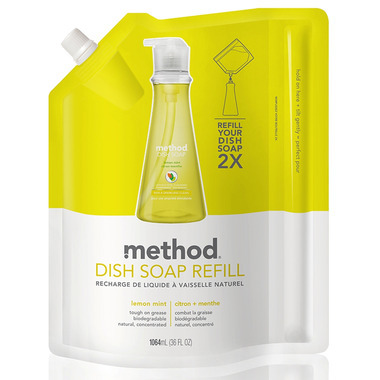 Method dish soap has become our favourite for kitchen and camping use. Lathers well and love the scent. Great for greasy messes as well. All other method products are equally as good at cleaning the home. I use their products as I have a well and septic system. Best soap ever ! smell good and clean super well even the grease on your oven and fridge. I love this soap. I can feel good about using it. It's gentle on my hands, and gets the dishes clean. Love the smell of this soap, as well as the size. I prefer to use a pretty container to hold my dish soap on my kitchen counter, so this is perfect for me. Also appreciate that it's less wasteful and has natural ingredients. Only dish soap I use. Smells great, gets the dishes clean and does not dry out my hands. Love this soap! It is very gentle on my sensitive skin so I don't have to worry about wearing gloves to do the dishes. A staple in my house. The scent is light, and the soap cleans well. Definitely a repeat buy! Love this product, along with all other method products. The lemon smell is very nice, not too overwhelmingâ€‹. I love using the refills from Method since it cuts down on waste and cost. The lemon mint scent smells nice as well. Love these products! The lemon for dish soap is always so refreshing & it's safe and affordable. Can't go wrong! Love all of the Method products! Great value for your money! Love the scent and cleans well and leaves things sparkling. I love the refill bag option. It is easy on the hands. Love the fresh scent. Cleans well. Doesn't dry out my hands.